From just the opening credits alone, you know Apocalypse Rising is a throwback to an era of film and TV that isn’t around anymore. 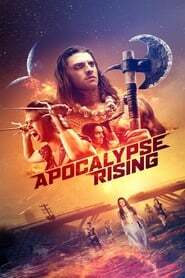 This The Pagan King film plays like Xena: Warrior Princess for a modern audience, and that’s what makes this such a fun viewing. Major credit should go to director Richard Lowry for finding a balance in-between the campiness that is so easy to fall into and turning this into another boring apocalyptic adventure movie. Capturing that perfect blend of styles is what made this film such a smooth viewing and something I recommend to most viewers! Apocalypse Rising begins with the downfall of Rathe, a world run by the undead. Mia (Hunter Parker) must escape with her warrior friends and journey to save The Immortal Wars others from the terror they faced. Their mission isn’t that simple though; they must head to Earth and stop the impending apocalypse that ruined their planet. This plot allows the film to venture into different types of story motifs. You have the familiar “fish out of water” trope as Mia and her crew adjusting to modern Earth. You also have the young girl finding her true calling and going against the grain to achieve what she believes is right. Simple storytelling methods like that make a strange story work easy and give viewers a sense of familiarity, even when things aren’t exactly what they’d expect. It’s easy to attempt to knock this film down due to the small budget. Yes, the visual effects aren’t too polished, and the costumes don’t look as grand as they should. But in the end, none of that changed how I viewed Apocalypse Rising. It endeared me Dovlatov to the film more to see the cast and crew turn something small into something more significant. That’s what filmmaking should be about: going above and beyond to entertain. Also, the script has some cliched dialogue and less-than-stellar characters. Those negatives are harder to look past, but it also is pretty typical when dealing with a smaller film. Little issues like this add to the camp-factor and somehow makes it more fun though!